May. 10, 2018 | May 10, 2018 | Family medicine physician Travis Ewing, D.O., has joined the University of Arkansas for Medical Sciences (UAMS) and will see patients at the Family Medical Center at UAMS East Regional Campus in Helena. 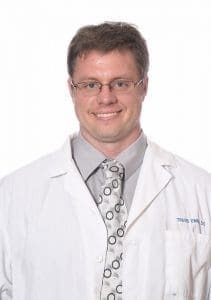 Ewing received his doctor of osteopathy degree in 2013 from the Lake Erie College of Osteopathic Medicine in Erie, Pennsylvania, and completed his residency in family medicine in 2016 at UAMS in Little Rock. In 2017, he finished a fellowship in sleep medicine at University of North Carolina at Chapel Hill. Ewing will serve as the director of the new sleep medicine program at the Helena Regional Medical Center. He is certified in basic life support, advanced cardiac life support, neonatal resuscitation and pediatric advanced life support. Ewing is married to Helena Regional Medical Center physician Stefanie Rust, D.O., and they have a 1-year-old daughter, Isabella.